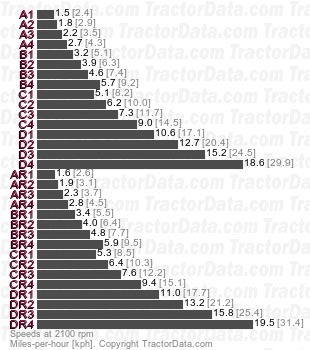 Four ranges, each with four gears. Operated via range shift lever with gear shift buttons plus reverser lever. Clutch must be used to change range, clutchless power shift between gears and for direction change. Speeds: With 18.4R38 rear tires. 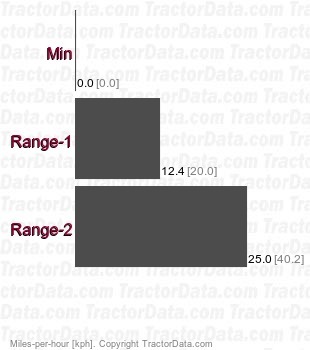 Five ranges, each with four gears. Operated via range shift lever with gear shift buttons plus reverser lever. Clutch must be used to change range, clutchless power shift between gears and for direction change. Automatic mode allows for computer-controlled automatic shifting to match load. 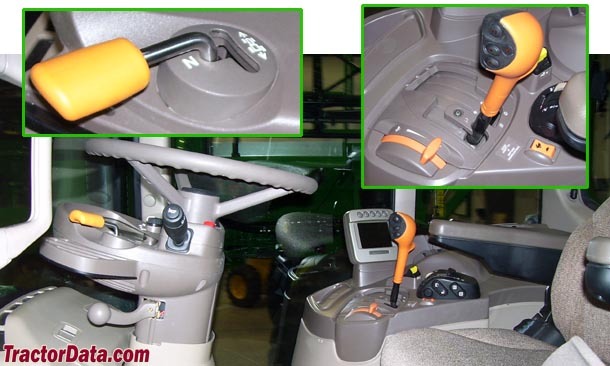 The IVT is operated with a right-hand speed control lever and left-hand reverser lever. The speed control lever is used to select speed in one of two ranges. A dial on the lever sets the maximum speed for the range. If a maximum speed of 2 kph or less is selected then the transmission will shift into creeper mode with a minimum speed of 0.05 kph.